Notes and plot summary in English and German. Libretto in German only. The desire to make an opera of Shakespeare’s King Lear was defeated or frustrated in a goodly number of composers – including both Verdi and Britten. But more than one Italian composer tackled the daunting project – including Stefano Gobbati (Cordelia, 1881), Antonio Cagnoni (Re Lear, 1893), Giulio Cottrau (Il Re Lear, 1913), Alberto Ghislanzoni (Re Lear, 1937) and Vito Frazzi (Re Lear, 1939). On the whole, however, it is composers from northern Europe – and composers of a more modern outlook, stylistically speaking – who have come closest to doing something like operatic justice to this most emotionally and morally demanding of Shakespeare’s texts. One thinks particularly of Aulis Sallinen’s King Lear (Kuningas Lear), premiered in 2000 – and of Aribert Reimann’s Lear. For Romanticism and Modernism, Hamlet was the quintessential Shakespearean tragedy, with its exploration of identity and the place of the individual in a society where historical continuity was elusive; Tennyson declared Hamlet “the greatest creation in literature”; it was around Hamlet that the modernists played their sophisticated - and serious - games of allusion. But in the years after the Second World War, in the years of the Cold War, under the shadows of the atomic bomb, it was King Lear that came to seem the central Shakespearean text. By 1960, L.C. Knights was writing that “in the twentieth century Hamlet has yielded to King Lear the distinction of being the play in which the age most finds itself”. Along with the new centrality of King Lear went a new kind of emphasis in the understanding of it – it was largely seen now as a play expressive of a pessimistic awareness of human suffering, as a play of the apocalypse. Jan Kott, an influential Polish critic who had suffered under both Nazism and Stalinism, wrote in his 1964 book Shakespeare Our Contemporary, “The theme of King Lear is the decay and fall of the world … Vivisection will go on until the stage is empty”. It is such a sense of the play that informs Reimann’s startlingly powerful, properly uncomfortable - offering no comfort - setting of Claus H. Henneberg’s German condensation of Shakespeare’s text. Reimann’s musical language is powerfully expressive; indeed one might reasonably describe it as expressionist. The idiom is essentially serialist and, in the broadest sense, Lear is an operatic descendant of Wozzeck, though even some admirers of Berg’s great opera might find Reimann’s sustained avoidance of obvious consonance rather challenging. The musical pressure barely ever relents; the articulation of evil and disturbance – in social, personal and moral realms alike – is fiercely, at times almost painfully, insistent. 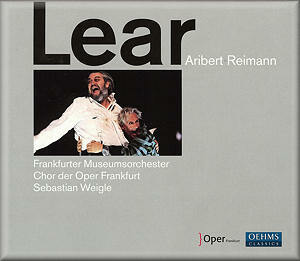 Lear is hardly likely ever to provide any arias for some future popular compilation of operatic highlights. Nor, perhaps, is it a work one would choose to see or hear too often – one’s nerves might not take it. But King Lear is a play that should disturb: Dr. Johnson memorably declared: “I was many years ago so shocked by Cordelia’s death, that I know not whether I ever endured to read again the last scenes of the play till I undertook to revise them as an editor”. One does need endurance where both Shakespeare’s King Lear and Reimann’s Lear are concerned; as a coherent evocation of a particularly bleak view of Shakespeare’s most disturbing play Reimann’s opera has a great deal to recommend it. It complements, musically, Shakespeare’s vision of a world in which, as Albany says, the “judgement of the heavens … makes us tremble”. The opera was composed at the urging of Dietrich Fischer-Dieskau and he sang the title-role gave the first production - at the Nationaltheater Munich in 1978. The previous recording of the opera, based on that first production, is memorable, not least for Fischer-Dieskau’s performance, painfully exquisite in its response to music and text alike; Julia Varady’s Cordelia is harrowingly beautiful too, and the work of the Bayerisches Staatsorchester, under the baton of Gerd Albrecht is a model of committed and disciplined passion. Both as an artistic achievement in its own right and as a document, that recording has a primacy that this second recording cannot, ultimately, challenge, let alone supersede. Yet this is a fine performance too and, in any case, Lear is not an opera whose artistic and emotional possibilities could ever be exhausted by any single recording or performance, however good. Here Wolfgang Koch gives a fine and moving performance as Lear, whether in his arbitrary, unbalanced exercise of power - mingled with fear and insecurity - in the opening scene or in his later descent into (and through?) madness and anguished abnegation. This is an interpretation to be heard alongside that of Fischer-Dieskau, as it were, rather than instead of it. Martin Wölfel offers a remarkable account of Edgar, more compelling, indeed, even than that of David Knutson on the earlier recording, his transition from tenor to countertenor voice weirdly beautiful and richly expressive of Edgar’s flickerings between sanity and a very plausible ‘madness’. Also very impressive are the Goneril and Regan of, respectively, Jeanne-Michèle Charbonnet and Caroline Whisnant, vocally secure - in some very difficult music - and thoroughly persuasive in characterisation. Indeed nobody lets the side down; the Frankfurter Museumsorchester copes well with the fierce demands that Reimann makes of them even if their playing, conducted by Sebastian Weigle, doesn’t quite have the sheer intensity of the earlier recording. In some ways it is a perhaps greater reflectiveness at key moments that distinguishes this second recording, along with a slightly more marked variation of pace and attack. The performances are not, finally, to be judged in terms of absolute superiority or inferiority; rather they invite us to see and hear slightly different aspects of a remarkable work. It is unfortunate that this new recording doesn’t come with an English translation of Claus H. Henneberg’s libretto; but even if you have only minimal German (like me! ), use of the plot summary provided and some knowledge of Shakespeare’s play should enable any committed listener to follow the German text and appreciate some of the things Reimann does with it. Beyond this slight reservation about the documentation, I have no hesitation in wholeheartedly welcoming this second recording of Reimann’s masterpiece - of which the recorded sound is vivid and full of impact. If I say that I hope that future years will see yet more recordings of Lear, it is not because I find these first two unsatisfactory - taken alone or together - but, rather, because I think there is probably even more to be found in the work.